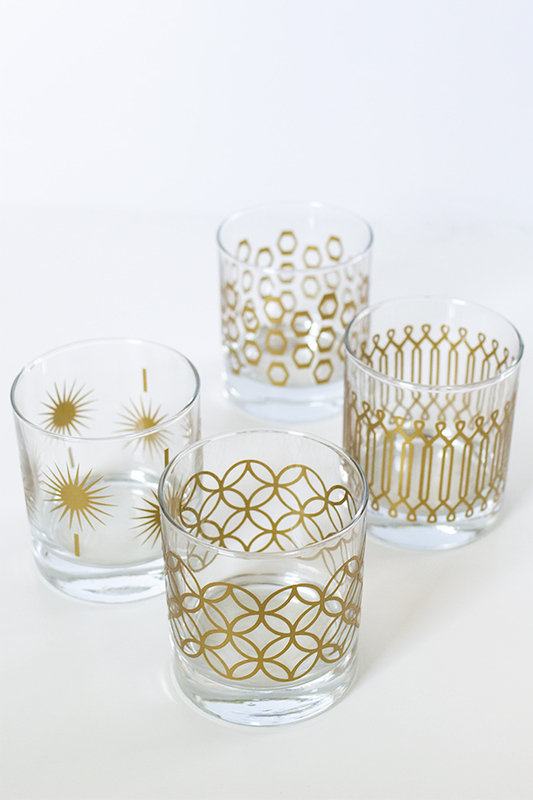 A couple weeks ago I spotted these gold metallic printed glasses at West Elm. I loved the simple, geometric designs but didn’t love the $34 price tag. 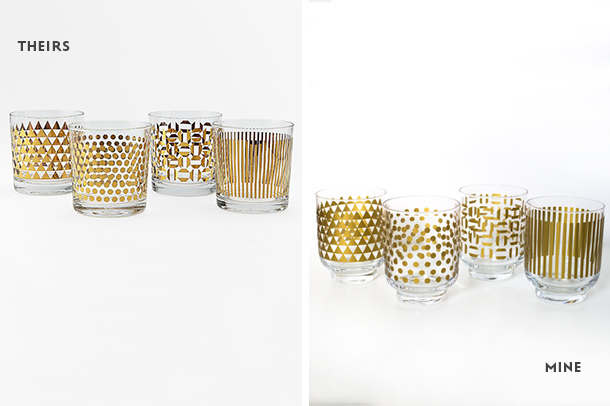 So I picked up a set of four old fashioned glasses at TJ Maxx for $8 and made my own metallic glassware using my Silhouette and some gold adhesive vinyl I had on hand. I created the geometric designs in Illustrator then converted them to Silhouette cutouts. I followed the same process for creating and adhering the decals as I did for my St. Patrick’s Day glassware. 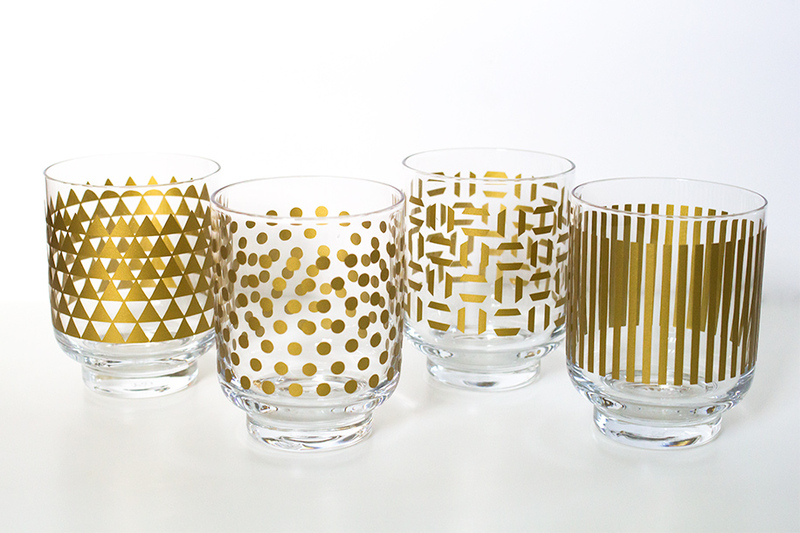 I also created my own, retro inspired designs on some old fashioned glasses I also picked up at TJ Maxx (similar). 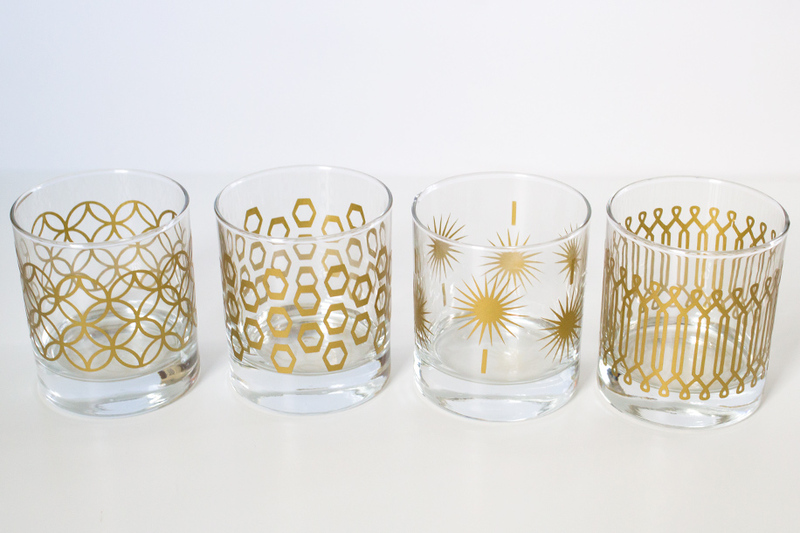 I recommend hand washing the glasses before you apply the gold vinyl and hand washing them after each use. I also found it easier to apply the decals by placing the center of the decal on the glass and rotating the glass as you smooth out the vinyl. Okay. So I’m obviously a big fan of your work, but this one TAKES THE CAKE!!! I am officially asking for a silhouette kit for Christmas…Nice job! Wow, you make it look so easy! They came out beautifully. Love the retro inspired prints. I am LOVING these, girl! I have been wanting a silhouette for quite some time. This may just give me the push! Love these glasses! Can we have a ‘how to silhouette’ party? I’ve had one in my closet for 2 years, used it once & wasn’t really happy with with. These are great. I actually like your designs better than theirs anyway!!! So cute! Soooooooooooooooo gorgeous. I NEED a Silhouette! I love the retro-printed ones the most! And since I’m not into printed glasses, I feel like I’ll be using this for something else :) Thanks for the download by the way! These are purrrrdy… Just what I need to host my first Christmas. Thanks for the template! WOW! This is great ? Love it! Those glasses was on y wish list. These are lovely! I too am a fan of the simple geometric designs. And the gold! Wow, these are great! Thanks so much for sharing the files! Your pattern mirrors theirs! Very classy design and thank you for your knowledge!! i have a silhouette cameo how do you download your templates for the glasses? Hi Norma, click the download link in the post above and it will automatically start downloading the Silhouette Studio file to your computer. The file will be in your downloads folder, or wherever your computer stores downloaded files from the web. Happy making! These look amazing. Nicely done. Did you cover vinyl after with any type of sealer? I have a project I am working on and I am worried about the vinyl peeling over time. Thanks so much! It’s not necessary if you’re using a durable vinyl such as an outdoor vinyl. My glasses didn’t start peeling until after a couple years of use but they definitely have to be hand washed. Are the links for these still available? When i click on it it takes me to an error page! Hi Dawn, I just re-uploaded the files and they are now available. Please refresh your page to get them!